Gilly began life in the 6th century as a Benedictine Priory ruled by Germain, Bishop of Paris. 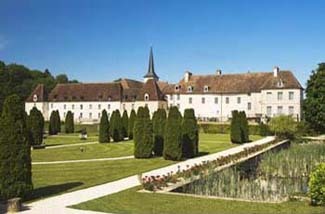 Later sold to the Cistercian order, the 16th-century abbot, Nicholas Boucherat II turned the property into a house of relaxation for the abbots after their hunts (despite the Cistercian reputation for austerity, discipline, and humility), a status enjoyed until the French Revolution. At that time monasteries became the property of the people. Subsequent owners assigned the house to farmers and workers until the department of the Côte-d’Or purchased the estate to turn it into a theatre in 1978. In 1987, hotelier René Traversac oversaw the restoration of the buildings and gardens to transform Gilly into a luxury hotel. Some of the less expensive guest rooms need renovation. Prices for small things, like glasses of wine, or coffee, can be expensive. Gilly is also a popular stop for visitors at the height of the season. Be aware that most of the guest rooms at the château are not air-conditioned. The château is halfway between Beaune and Dijon—just off highway D974. From Beaune, take A31 towards Dijon; exit Nuits St George and follow signs to Gilly-les-Cîteaux. Nearest train station is at Dijon—15 km. Superbly located in the heart of the Bordeaux wine region between Beaune and Dijon, the Château de Gilly enjoys lovely gardens and a friendly staff. When approaching the château the first thing you’ll notice is the web of moats, which have origins in the 6th century. Interiors of the main building are embellished by rich tapestries on old stone walls and suits of armor. Ceilings can be painted or vaulted. Guest rooms fall into six categories and are located in either the main house or in two adjoining pavilions—the Pavillon du Pere Abbé or the Pavillon des Jours. All have views of the gardens, and a few have views of the village or Vourge River. One suite features a stone fireplace, and another rich wood paneling. Room decor is traditional French floral. An underground passageway leads to the formal Clos Prieur restaurant. Originally the wine cellar for the Cistercian monks, today it’s a fantastic setting for an elegant dinner, among slender pillars that support a rib-vaulted ceiling. No less than 15,000 bottles fill the château’s cellars. During the summer months lunch can be enjoyed outside on a shaded, flower-filled terrace.